Atlanta Public Schools first grade teacher Elizabeth Emerson was not quite sure what to think when new Atlanta Public Schools Superintendent Dr. Meria J. Carstarphen invited Emerson to join her center stage Thursday afternoon. Moments earlier, Carstarphen surprised Emerson when she announced to the Springdale Park Elementary audience that they were there to celebrate Emerson’s exemplary teaching, a comment that caught the teacher totally off guard and left her befuddled. The Atlanta Families’ Award for Excellence in Education recognizes the “best of the best” in Atlanta education. By recognizing excellent educators each year, the AFAEE seeks to retain excellent teachers and school leaders, inspire other educators to transform their craft, and increase the public’s awareness of educator and student success across metro Atlanta. Metro area educators receive this award by demonstrating excellence in three areas: raising student achievement, enhancing students’ self-esteem and collaborating with multiple stakeholders for the benefit of students. Ms. Emerson has been at Springdale Park for five years but she’s been teaching for twelve years. The former lawyer was selected as one of Atlanta’s best educators because her work in the classroom resulted in 100 percent of her students growing on their computer adaptive tests. Her dedication to teaching also helped her students grow 14 percentile points in math and 1.34 years in reading. 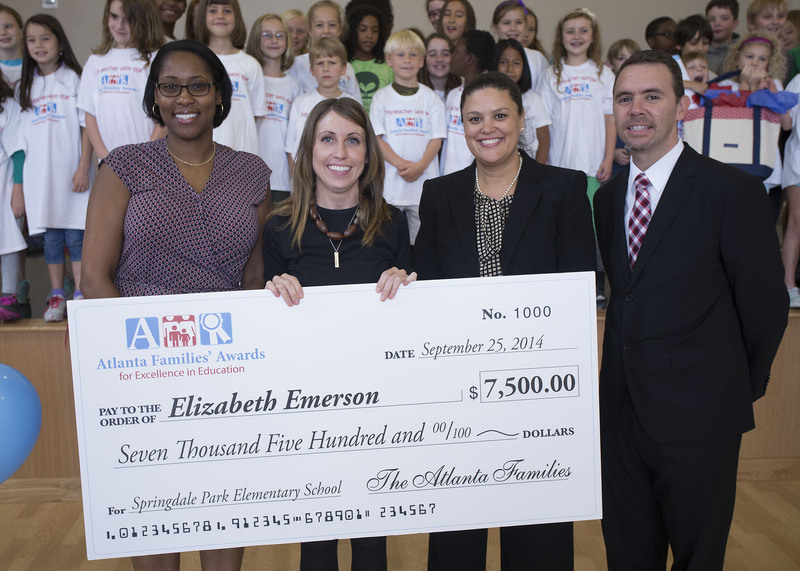 As an AFAEE winner, Emerson receives $7,500: she will apply $3,500 to fund a school project on research-based best practices and $1,500 toward training that will help her become even more effective in the classroom. The remaining $2,500 is designated as a personal stipend.